Missouri’s rate has now been at or below the corresponding U.S. rate, which was 4.0 percent in January, for 46 consecutive months. 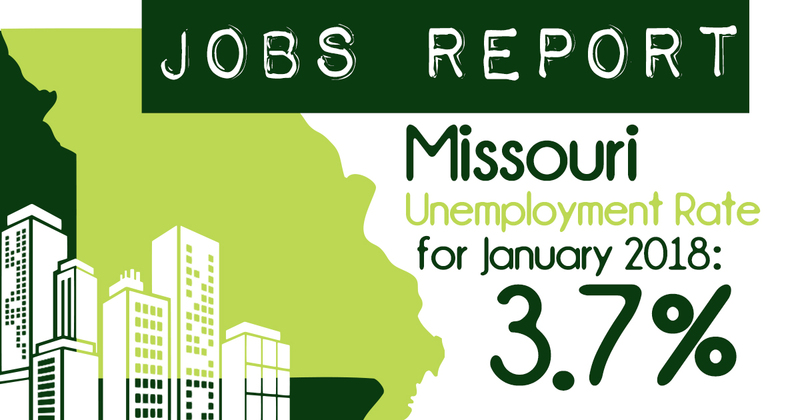 Employment in Missouri increased substantially over the month. Missouri nonfarm payroll employment increased by 9,300 jobs from the revised December figure, reaching 2,903,400 in January. In the goods-producing sectors, construction employment was up by 2,600 jobs on a seasonally adjusted basis. Manufacturing employment was little changed over the month. Missouri’s rate has now been lower than the corresponding U.S. rate, which was 3.9 percent in December, for 44 consecutive months. The state’s not-seasonally-adjusted rate was 3.0 percent in December, compared to the national figure of 3.7 percent. Missouri nonfarm payroll employment jumped by 4,100 jobs over the month, on a seasonally adjusted basis. Additionally, November’s employment level was revised up by 3,600, bringing the two-month gain from October up to 6,500. Missouri’s rate has now been lower than the corresponding U.S. rate, which was 3.7 percent in November, for 43 consecutive months. The number of unemployed Missourians decreased by 901 to 93,460 in November, on a seasonally adjusted basis. The state’s not seasonally adjusted rate was 2.5 percent in November, compared to the national rate of 3.5. Nonfarm payroll employment in Missouri increased by 3,300 jobs in September, on a seasonally adjusted basis. With an upward revision of 1,800 in the August data, nonfarm payrolls have grown by 6,100 jobs since July. In September, employment grew in durable goods manufacturing (+2,200); construction (+1,300); transportation, warehousing, and utilities (+1,200); and accommodation and food services (+1,200). September’s job gains helped push the over-the-year growth figure up to 39,300 for September, an increase of 1.4 percent from year-earlier employment. Missouri’s unemployment rate remained at 3.6 percent in May, and total nonfarm payroll employment edged up by 400 jobs. Missouri’s smoothed seasonally adjusted unemployment rate has been 3.6 percent since March and was 3.7 in May 2017. The estimated number of employed Missourians was 2,937,194 in May, while the number unemployed was 108,288. The jobless total has been edging down since January. 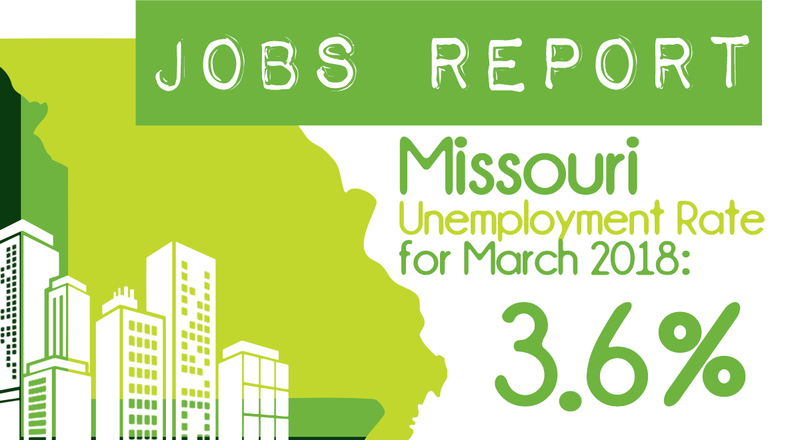 JEFFERSON CITY, Mo.—Missouri’s unemployment rate edged down to 3.6 percent in March, while payroll employment grew by 3,100 jobs. The unemployment rate is down a tenth of a point from February, equaling the rate that prevailed from July through November of 2017. The last time the rate was lower than 3.6 percent was July 2000. 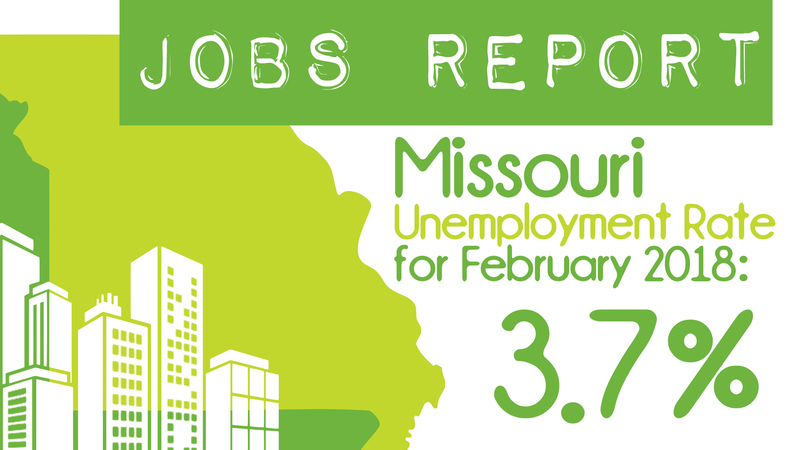 Employment in Missouri grew by 6,600 jobs in February, while the unemployment rate remained steady at 3.7 percent. For comparison, the seasonally adjusted U.S. rate was 4.1 percent in February, and the not-adjusted rate was 4.4. Missouri’s seasonally adjusted rate has been lower than the comparable U.S. rate for 34 straight months. JEFFERSON CITY, Mo.—Missouri nonfarm payroll employment grew by 4,900 jobs in January from the revised December level, while the unemployment rate remained low at 3.7 percent.